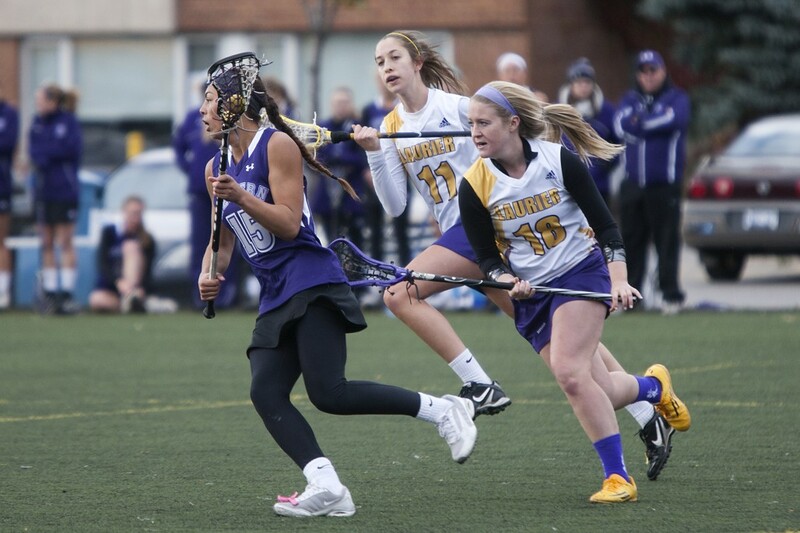 The Wilfrid Laurier University women’s lacrosse went 2-1 over the weekend, ending their season with a record of 7-4-1 as they head into the playoffs. They managed to knock off the Brock Badgers by score of 10-8 on Saturday in Guelph, before splitting two games at home between the McMaster Marauders and Western Mustangs on Sunday. The scores were 12-7 and 10-19, respectively. Head coach Lynn Orth had mixed feelings about her team’s performances across the three games, and was disappointed with the amount of penalties her team was getting called for. “We played our best game this weekend against Brock. We did not play well against McMaster but were really lucky that we fought out a win. We know we can play with Western,” she said. The Mustangs are currently 14-0, as no team has been able to record a win against them thus far. Sara Hatch, a fourth-year attacker for the Hawks, said the weekend gave the team some confidence going into the postseason. “Honestly, minus the cards, I think we played really well. I think it’s okay because we had that good game against Brock and even though today was a little rocky, I think that gives us the momentum to go into OUAs,” she said. Hatch had 10 goals and an assist over the course of the weekend, and believes her team has a significant chance to be the ones to knock off the Mustangs and claim gold. “I honestly believe that we can. We proved today that we can keep up with Western, and hopefully we will meet them again in that gold medal game and take the gold,” she said. Orth stressed that the team is very well-rounded, which she believes is a major asset to them. Communication is something that Hatch believed was key in giving the Hawks two wins this weekend, however she explained that the team needs to continue to work on the mental side of the game and play with a level head. “Just not getting hyped up and letting them get in our heads. Just focus on playing our game, playing Laurier lacrosse and slowing the ball down,” she said. Orth missed the entirety of last season after being diagnosed with cancer. She has since recovered significantly and is hoping for a positive result this year. Her emphasis is on making sure the team plays well together, rather than focusing on a specific goal. “I think we just need to carry forward with enjoying playing together, and playing our game and it should work out great for us,” she said. They begin their quest for the OUA championship on Friday Oct. 31 when they take on the UOIT in Oshawa. Author: Josh PetersJosh is a third year BBA student and former Sports Editor for The Cord. He believes sports is the only reason cable television still exists, and is forever in love with the underdogs. Josh aspires that one day his jump shot will as strong as his passion for sports journalism.